Celebrate the flavors of fall with our Maple-Pumpkin Custard Cups. These pumpkin custard cups, the perfect autumn dessert, require just 20 minutes of prep! Mix first 4 ingredients in large microwaveable bowl until blended. Microwave as directed on package for cooked pudding. Cool 5 min. Spoon 1 Tbsp. 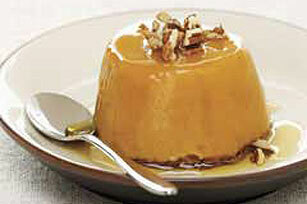 syrup into each of 6 (1/2-cup) custard cups; cover with pudding. Top with cookies; cover with plastic wrap or waxed paper. Refrigerate 4 hours. Run knife around edge of each custard cup to loosen dessert just before serving. Invert onto dessert plates; top with nuts. Substitute gingersnaps or sugar cookies for the oatmeal cookies.